When you can’t visit in-person with friends and family, the next best thing is video chat on Skype. In the past, that meant crowding the family around your computer's webcam to talk to grandma. And let's face it, many home office environments are not the most attractive place in the home. With Skype-enabled HDTVs, you can now sit in your living room and chat in comfort. The Skype camera’s wide-angle lens on your TV captures much more than the usual computer webcam. In fact, it can cover a whole family sprawled on the sofa and the built-in stereo microphone accurately picks up the conversation. • A Free Skype account. Setting up your TV for Skype is simple. First you’ll want to connect your TV to your home’s broadband network. Some TVs come with Wi-Fi built-in, for others you can buy a compatible Wi-Fi adapter. Or simply plug an Ethernet cable into the TV and then into your network’s router. Next, you’ll need to plug a compatible webcam into your TV. Not just any USB webcam will do, so make sure you check your manufacturer's recommendations. For instance you'll need a Panasonic communication camera to plug into one of your Panasonic Viera TV's USB ports. Finally, you’ll need to launch the Skype TV service using your TV’s remote control. Each manufacturer has a name for their Internet service. For instance the Panasonic service is called VIERA CAST. Pressing the VIERA CAST button on your TV's the remote will bring up a list of apps, including Skype. Once the Skype software is running, you need to log into the service. If you don't already have a free account, you can create one using the TV remote control. To make a call, the person you're trying to reach must have a Skype account and accept you as a contact. Once the contact accepts your invitation and is in your address book, you simply select him from your contacts and hit the ‘Video Call” button. The person you’re calling can be on a computer or another Skype TV. Once the recipient accepts your video call, you’ll see him or her and you can begin your conversation. 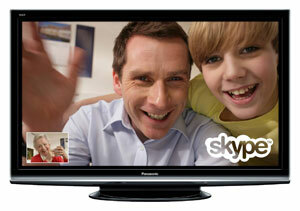 To receive Skype video calls, you can choose to automatically log in to Skype when you turn on your TV. When someone calls, a notification will pop up and you can either start chatting or indicate that you are not available (helpful when watching the season finale of your favorite show!). This article was brought to you by Panasonic. It’s a little hard to understand what your issue is. Sounds like you’re using a Skype cam on your Viera, and can connect to others on Skype but can’t see them. Not clear why your computer is involved. Are you using an official Panasonic Skype camera or another camera? Only the official Panasonic one is likely to work properly.